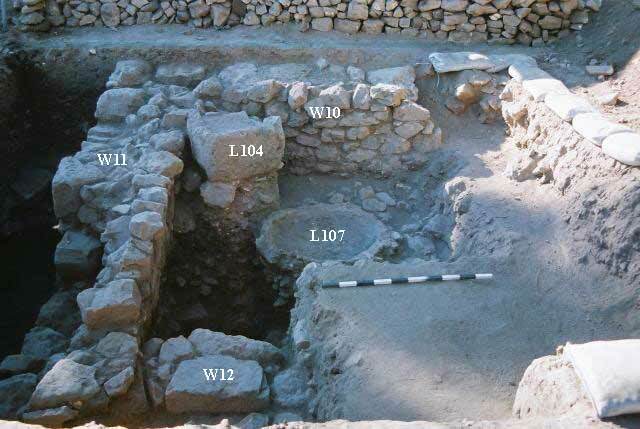 During November 2003 a trial excavation was conducted at the Nof Harim Regional School in Qibbuz Sasa (Permit No. 4025*; map. ref. NIG 23723/77032; OIG 18723/27032) prior to constructing an additional wing to the school. The excavation, on behalf of the Antiquity Authority and financed by the Upper Galilee Regional Council, was directed by H. Bron, with the assistance of A. Dadush (administration), V. Essman and V. Pirsky (surveying), H. Tahan (pottery drawing), H. Smithline (photography) and E.J. Stern (pottery consultation). The site is situated on a rocky hilltop, between Gush-Halav and the Druze village of Hurfeish, in Qibbuz Sasa and in the area of the abandoned Arab village of Sasa. The excavation area consisted of a single square that was located on the higher ground to the east of the existing school complex. 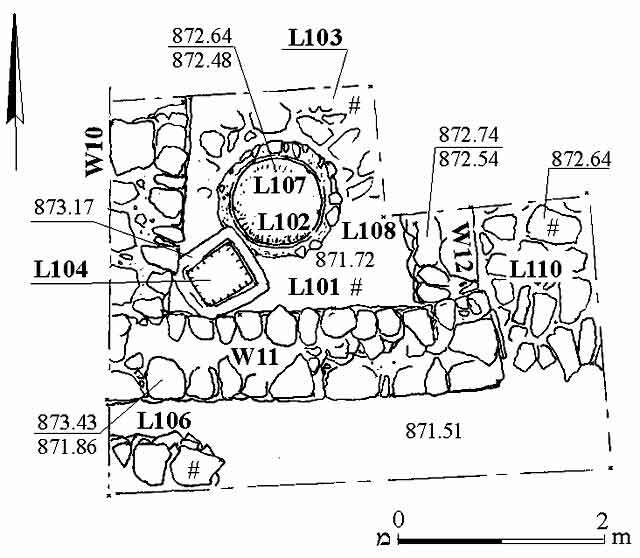 Level 4: Layer of building stones below Mamluk remains, date unknown. Level 3. A courtyard surrounded by three walls was exposed (Figs. 1, 2); its northern side remained unexcavated due to a trench that had cut this area. The southern wall (W11) of the courtyard was founded on top of a layer of collapsed building stones that sloped southward (Level 4). The eastern part of W11 was severely damaged by modern mechanical equipment. Pistol cartridges from the 1940s, as well as a badly corroded unidentifiable coin were found here. Wall 10, built of small and medium-sized fieldstones and preserved 1 m high, enclosed the courtyard on the western side. The partly exposed Wall 12 enclosed the courtyard on the eastern side. It was badly preserved and survived a single course high. The courtyard was filled in to lay the floor that consisted of beaten soil and small stones (L103), which abutted the three walls enclosing it. A tabun constructed from burned clay (L107) was set on the floor. Part of a pavement (L110) that consisted of large flat stones was exposed east of the courtyard. A small section of this floor was encountered on the southern side as well (L106), leading to the assumption that the paved floor surrounded the courtyard at least on two sides. Ceramics dated the courtyard complex to the fourteenth–fifteenth centuries CE, including mainly glazed bowls or platters of Green and Yellow Gouged Ware (Fig. 3:1), Monochrome Glazed Ware (Fig. 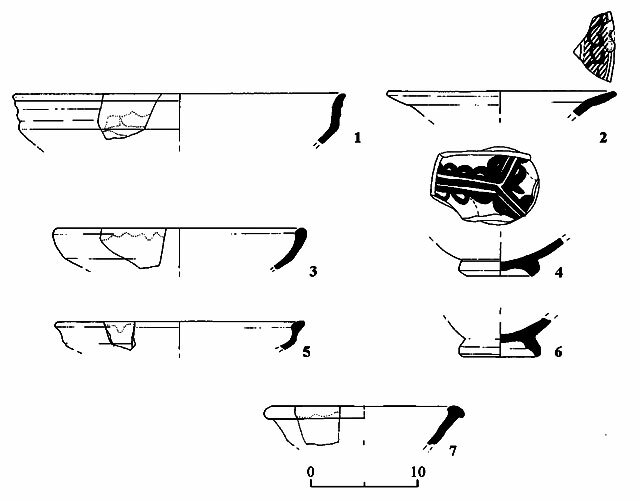 3:2–4), Gouged Sgraffito Ware (Fig. 3:5, 7) and Slip-Painted Ware (Fig. 3:6). Level 2. The courtyard complex continued to exist during the Ottoman period. At some point, a new beaten-earth floor (L101) was laid upon the earlier tabun (L107). A new tabun (L102), similar to L107 and immediately below it, was constructed above this floor. Together with the L102 tabun a limestone trough (L104) was placed in the inner corner of W10 and W11. Ceramics from this level and inside the tabun contained a small number of Rashaya el-Fukhar pottery. Due to lack of time the excavation did not reach bedrock; however, since the Mamluk remains were built over a layer of building stone debris indicates that further occupation levels exist underneath. 2. Excavation square, looking west.